Russell Slade said he had not experienced a home atmosphere like Saturday's 1-0 win over Fulham since becoming Cardiff City manager. Many supporters had been unhappy since the club was rebranded to red in June 2012 when Vincent Tan bought the club. 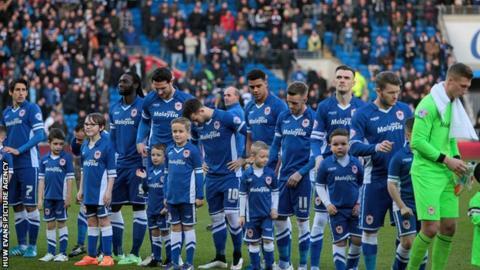 But on Friday Tan sanctioned a return to Cardiff's traditional home blue kit and the fans turned out in force. "It was a totally different atmosphere to any I've witnessed so far this season. I was very proud," Slade said. "Although the game was very tight throughout, as it's always going to be at 1-0, the fans were fantastic, awesome, right behind us from the first minute till the last. "I was told about the passion of the fans when I came to Cardiff City and what a good group they were, and they were overwhelming today. "It's the '12th man' sometimes you need, sometimes you miss, that's what keeps you going, that's what makes players run that little bit further sometimes. "Tom Adeyemi had no right to get a slide tackle in in the last two minutes, he's ran 50 yards and... got a standing ovation. That lifts you, that's got to lift you." With the majority of the 22,515 roaring them on, Cardiff took the lead against Fulham through Sean Morrison's 14th-minute header and saw out the rest of the game to record their first Championship win in six matches. Slade was delighted with the way the players kept their composure despite all the emotion surrounding the game. "There was an excitement, there's no doubt about that, but then it was vitally important then that they stick to the game plan and they stay in control because they know it's going to be a big atmosphere," Slade added. "At this level just one slight mistake, you take your concentration away and it could be vital. "I thought we were quite mature how we managed the game second half. "Obviously you want that second goal to take that little bit of pressure off, but we reduced them to very little in the second period."